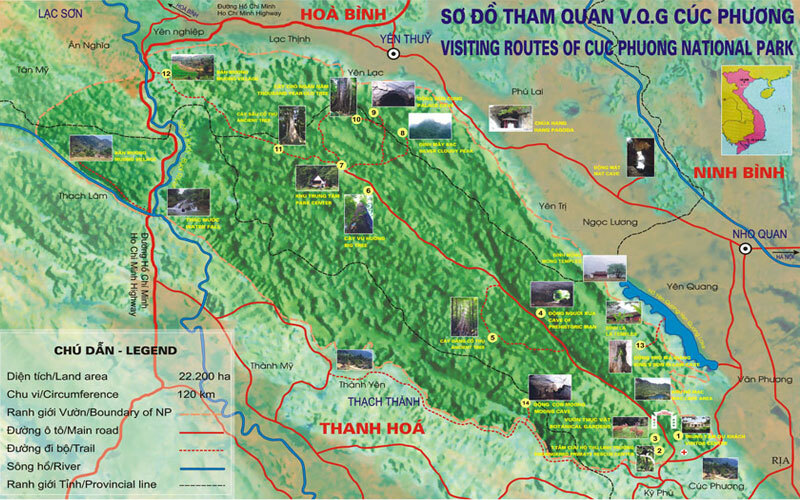 Established in 1962, Cuc Phuong is the oldest national park in Vietnam. Located only 120km southwest of Hanoi and nestled between the provinces of Ninh Binh, Hoa Binh and Thanh Hoa, Cuc Phuong boasts an engaging cultural and wildlife heritage and enchanting scenery. Magnificent Limestone Mountains rise up majestically from the green rice-terraces and traditional stilt houses of the Muong hill-tribe. Covered in a dense forest, this landscape forms the habitat for some of Asia's rarest animal and plant species. It is no wonder that researchers, naturalists, enthusiasts and conservationists alike are drawn to this corner of the world. The ancient forest harbours over 2234 vascular and non-vascular plants, 122 species of reptiles and amphibians, and 135 species of mammals, including the Clouded Leopard, Delacour's Langur, Owston's Civet and Asian Black Bear. There are also an incredible 336 documented bird species. Visitors in April and May should be blessed with the chance to see literally thousands of vibrant butterflies. Located on 2 limestone mountain ranges, the landscape of Cuc Phuong contains a wonderfully rich ecosystem. The rocky outcrops of Cuc Phuong form the site of valuable pale ontological and anthropological vestiges, including a fossilized sea reptile dated at 200 - 230 million years old, while the remains of prehistoric people who lived in the forest some 7500 years ago are also to be found in the numerous mountain caves. In earlier times, Cuc Phuong was home to the Muong minority people and to this day a few scattered villages around the park's periphery still house these interesting people and their unique culture. If you visit these communities you can still see their traditional stilt houses, waterwheels, bamboo rafts and brocade looms. - Plan - finance Department. - International Cooperation & Scientific Department. - Environmental Education & Services Center. - The Organism Rescue, Conservation and Development Center. Year 2000, the Government granted with the title of Hero of labour in the Innovation period. Year 2002, the Government granted Independence Medal as the park has gained many achievements in nature conservation and many other noble rewards.